We took a few weeks relocation hiatus so apologies if your Sunday Morning Coffee got cold. I’d be remiss if I didn’t thank everyone that called and wrote that they missed us. Thanks to both of you. It’s only fitting as a new Nevada resident we get back into gear on Nevada Day weekend. 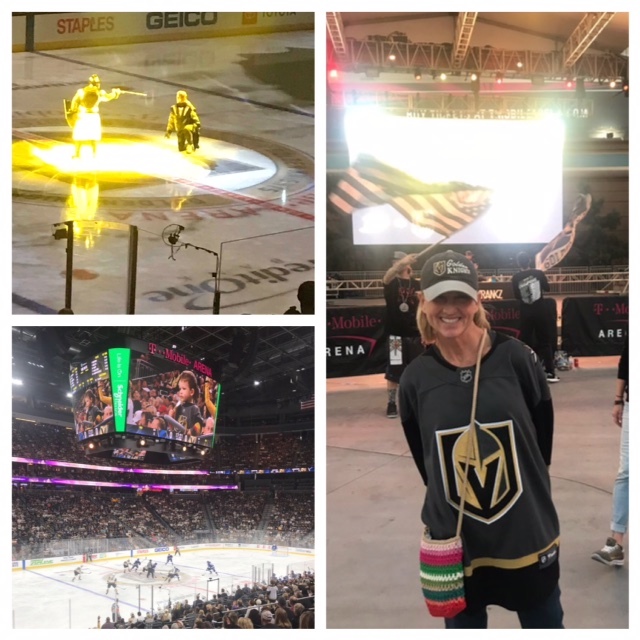 I have no idea what Nevada Day is other than on Friday, schools and offices were closed and the local hockey team, the Vegas Golden Knights, played an afternoon holiday game at 3 pm. The brothels, however, remained open. It must be an important day. Since moving here, I’ve discovered that Southwest Airlines lied to me. Their in-flight announcements all these years convinced me that Las Vegas really meant ‘Lost Wages.’ Taking my citizenship exam, I’ve since learned the translation really means ‘The Meadows’. I like that better anyway. 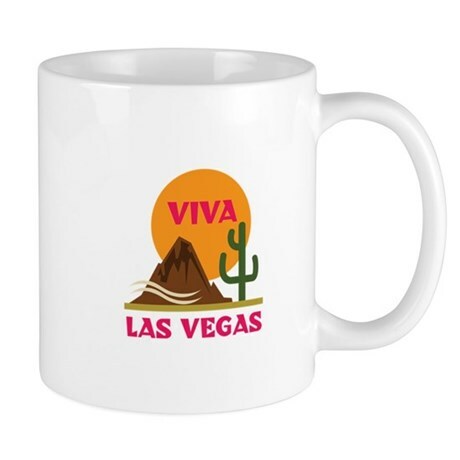 What I also learned is if you want to live in Nevada, you better say it with a short ‘a’ like in ‘asthma’ instead of a long one like ‘aroma,’ or risk being unmasked as a recent immigrant. The locals might find it reason enough to build a wall. We’ll be residing here a month on Tuesday but please don’t tell the DMV. Thirty days is the deadline to get a drivers license and register your vehicle. Like everyone else out West, we’ll get around to it when we get around to it. And speaking of beauracracy, my guess is everyone on the map right of the Grand Canyon would struggle to recall from fifth grade civics that our state capital is not Reno, Vegas or even Purumph, but Carson City. “I’ll take State Capitals for $200, Alex”. Truth is I’ve been coming to The Meadows since June, 1974 when my dad brought me out here as a college graduation present. It was probably more of an “I don’t have to pay tuition anymore” gift to himself. I remember we stayed at the MGM, brand new at the time, which six years afterwards burned to the ground and once rebuilt became Bally’s. Later, MGM found a tract of land south on Las Vegas Blvd and become Grand. There was something about that trip and this city, forty-four years ago, that grabbed me and wouldn’t let go. Through the years my landings at McCarren became frequent; first for fun, and then over the past thirty years multiple times a year for conferences and conventions. I used to love it; then, I began to loathe the crowds, the chaos and the prices. It had stopped being fun long ago. But somehow I always knew I would wind up here. I was rejected by the Las Vegas Review-Journal and the Las Vegas Sun to be a sportswriter in ‘74 but nonetheless went about my business always figuring one day Las Vegas would be home. Having Jason and Scott now living down The 15 in Los Angeles provided the retirement incentive to move next door to the same time zone. So as Andi and I unpacked the last of what seemed like six thousand boxes of mostly stuff we didn’t need but brought anyway, we are finally close to setting up that home. And what we’ve discovered is Summerlin — eighteen miles northwest of the airport, a dozen miles from The Mirage and eight miles due west on Sahara from the Stratosphere — is an incredibly dynamic, contemporary, active and vibrant community. Being within three miles of the Red Rock Canyon, it’s also gorgeous. In fact it’s so attractive that a recent parolee named OJ also made it his home. Mr. Simpson lives with a friend in our gated community, plays on our golf course, and has a fairly high community profile. We wish him luck on his continued search for the real killer. While Andi misses her Birmingham life, Ibis and Deuce have been very quick to respond to their new digs. Both celebrated their first desert birthdays in the past two weeks with Ibis turning ten and Deuce (fittingly) two; their new surroundings, sights, and mainly the scents, have given them a renewed burst of energy. It’s nice to see Ibis, who for a while was as sedate as the New York Giants offense, sprinting after desert rabbits, playing, and trying to avoid cactus. Taking them into Red Rock Canyon and watching them explore almost justifies the twenty-seven hour drive out here. 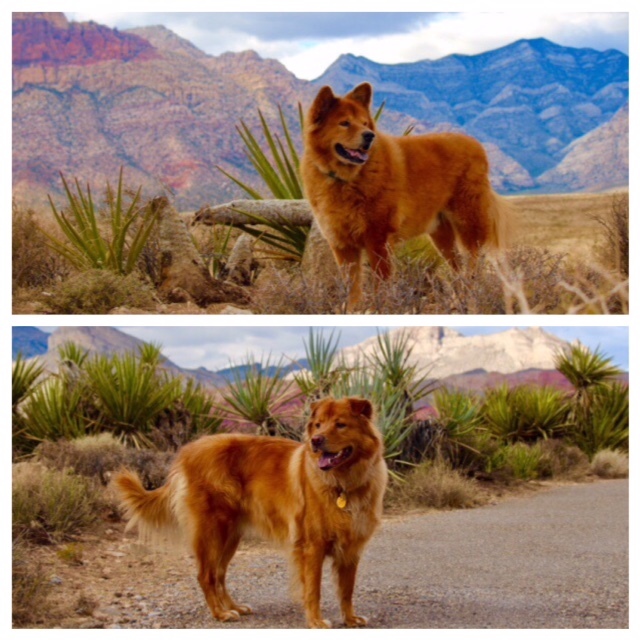 A couple of desert dogs, Ibis (top) and Deuce , give a smile of approval for their new Red Rock Canyon home. Fortunately gambling isn’t an issue for Andi or me. The only chip we’ve touched since we’ve been here was a few nights ago with salsa at a Mexican joint. We haven’t yet been to the Strip yet but that day is getting close, in fact probably this week. Andi wants to go to the ‘Fetish and Fantasy Ball’ at the Hard Rock for Halloween. How can I say no? Moving from Central time to Pacific is still an adjustment for us both. We get up way too early in the morning but the sunrise over the mountains can be exquisite. However, weekend football games on television start too early and World Series games still go too late. Unfortunately though, if money gets tight, we can’t win Mega Millions or Powerball. For the twentieth straight year we are living in one of eight states without a lottery. Hawaii, Arkansas, Alaska, Utah, Mississippi and Wyoming join Alabama and Nevada (short ‘a’) in legislating morality. Truth be told, the religious do-gooders kept lottery out of Alabama and the casinos made sure it didn’t happen here in Nevada (short ‘a’). And while you can’t buy a scratch-off ticket in Vegas, you can buy a joint at one of the many licensed, regulated and upscale pot dispensaries around town. The casinos probably had something to do with that, too. “Hey man, I only have nineteen, hit me and let’s see if I can get closer to twenty-one” can likely be heard at blackjack tables from Mandalay Bay all the way downtown to the Golden Nugget. Vegas, at 2.3 million, is our 28th most populated city and will become the next great live sports town in the country. The casino sports books have always made it a special place, but you haven’t seen anything like the pre-and in-game production at a Vegas Golden Knights game. It’s beyond description. The other great entertainment not withstanding, there is something special about a Golden Knights game in Vegas. Their newest fan dresses the part. The Knights, who as a first year team defied stacked odds in a town that was built by odds and were Stanley Cup finalists last year, play in front of 18,000 a game in an arena built to seat a thousand less. The crowd is young, over-proportionately female and downright fun. Golden Knights apparel runs rampant everywhere. The National Hockey League took a gamble on granting the first professional sports franchise to this city and look smarter day by day for that leap of faith. The NFL Raiders will be here in a great new stadium in two years and maybe by then they’ll win three games in a season. A 10,000 seat baseball stadium for Oakland’s AAA team is almost ready a couple of miles from our front door in Summerlin, and word is the stadium is expandable for a future MLB franchise. Perhaps one day UNLV Runnin’ Rebels basketball will start runnin’ again. And if there was ever a town that epitomizes an NBA franchise, it’s this one. In the meantime you’ll excuse me for enjoying this 80 degree day on my patio lounge chair as I count down the hours remaining in Nevada (with a short ‘a’) Day weekend, officially the last Friday in October, celebrating the state’s 1864 admission into the Union. That’s even older than Cher. Agh, the endless unpacking of boxes. Surprised you haven’t find something you had long forgotten about in one of those boxes – often a pleasant suprise. Those stupid papers just didn’t realize the talent level they were passing on. Their loss, our gain. Welcome back (long ‘a’) to Sunday Morning Coffee. Another good one, Roy! I wondered where you’d gone. You made the right retirement choice, clearly.